Just a shout out to the Dolmar faithful, anybody think that the Tillotson carburetor is that much better over the Walbro? I have a 115 with the Walbro and was thinking of swapping the carburetor with a 111i. Appreciate any thoughts on this, thanks. Do it, the 111i makes these saws much easier to start and they run very nicely. Thanks for the reply. I'm guessing that the Tillotson carb on the 111i swaps straight out with the Walbro on the 115, right? It does, choke levers also. The last time I bought a new saw was my Partner 1984 that is until I bought this today. I have been looking for a new saw and been reading and researching comparing costs and so on and I decided I would try a Dolmar. My saws are the Partner 500 and 5000+ series for the most part. According to what I read and what the dealer said this should be close to my 5000+ saws. I was looking for something in the 50-60cc range and not too heavy. I have 70 acres of wood lot that are in tree growth and I am in the process of thinning certain areas. Now I am working in a Beach grove thinning for Mast crop tree release. But soon I will be in a dense fir growth, small trees 2"-3" In diameter so I need something that will work well for what I am up to. I have 65cc and 70cc partners if needed but to be honest the older I get the lighter I like em. It came with the factory "safety "chain and I told him that was not something I thought I wanted. He gave me a loop of this full chisel Tri-Link? chain and asked me to report back to him how it worked. He said it was pretty new to them that they only had a few customers saws running it but no feed back yet. scottr, sixonetonoffun and fossil like this. Does anyone know the dimensions of a dolmar 114 piston? Is this piston close enough to work? compression height from the 112-113-114 piston is 3 or 4 mm lower. I have a couple of SD 123s, one dating from 1980 and still cutting well with a 22" bar. I recently bought a secondhand SD100S for lighter work -- half the weight of the 123! I am having difficulty identifying its year of manufacture from its serial number which is 0217347299. Does anyone here know how to find a Sachs Dolmar date/year of manufacture? mmm My 100S is clearly marked 93 with a gap and then the serial number - sure its not 92 as the first two digits? I have a 5105 (I think) that will need a complete teardown including splitting the case. Any thoughts on skipping the case gasket and just using sealer? I could use a good IPL for this one as well since I don't have this exact model. Are there any dowel pins in the case to help with alignment? Do they need to be driven out before the case is split? Finally, the clutch is being very stubborn. I made up a tool that I can use in my butterfly impact wrench but the clutch won't budge...yes I am trying to remove it clockwise. I put some PB blaster on it yesterday and left it to soak, will try again tonight. Still looking for the IPL for the 5105. Progress on the clutch, after shooting it with PB Blaster and letting it set for 24+ hours, it came right off with the next shot of the butterfly impact wrench. Someone evidently power washed this saw as it was very clean on the outside, not at all under the covers, and the bearings are more than a little stiff. Thanks. This sent me back to examine it with a 10x magnifier. I realise now that the '7' was a forward slash. So it actually reads 021/347299. Surely not January 2002? Where can I get crank seals, are they standard seals? 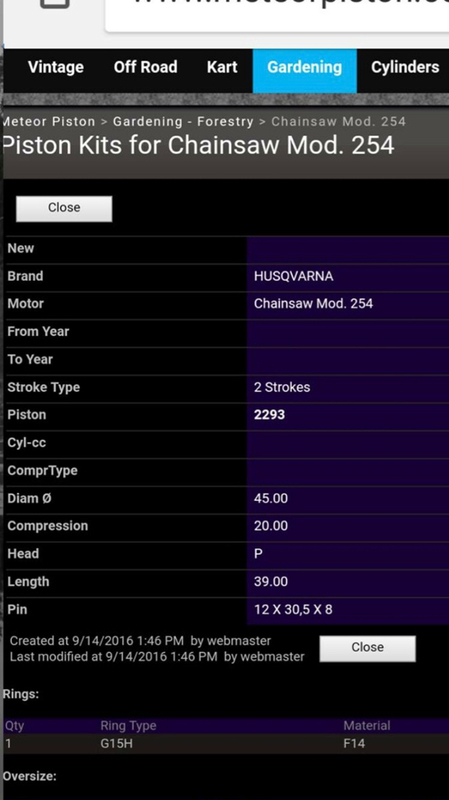 It uses a 45mm piston, is there another dolmar or husqvarna piston that is the same? I need to split the case because the paint is peeling up. Are there any parts available such as crankcase gaskets? Does the KS cylinder have better port timing than the Mahle? My old piston is fine so I may not need one. 99% sure those seals are standard , for 123 series it is and sizes are sometimes writed on ipl . I plan to put my PS50105 back together tomorrow, IPL says to "use glue" on the flywheel side bearing. After dismantling the saw I understand why, when I carried the crankcase half over to my small arbor press to remove it, it fell out...fortunately I have some thick rubber padding on the floor in that area.